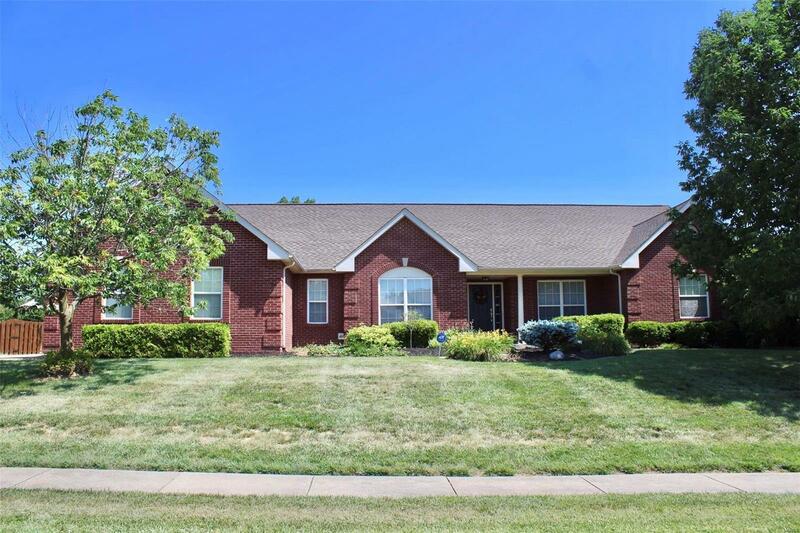 A remarkable brick combo ranch home on .8 acre with a fenced back yard! Split bedroom concept. Entering the quaint entryway, the formal dining room is to the left, formal living room is on the right, both rooms are spacious and have carpet floors, Opening up to the great room with hardwood floors, gas fireplace and vaulted ceiling. The Eat-in Kitchen host new Stainless Steal appliances with abundant cabinetry, new granite Counter-tops and breakfast bar. There's a beautiful Sun Room with a cathedral ceiling just off of the kitchen. French doors open to the large Master bedroom suite with separate shower, jetted tub, his/her bowl vanities and walk-in closet! Two additional main floor bedrooms with plenty of closet space. Full finished with custom oak wet bar, media room, workout area, slate pool table, dart board, cedar closet and 4th bedroom with new paint! Additionally, a Â¾ bath. The 3-car side entry garage w/work bench & custom shelving. Roof was replaced in 2012.